About the Book: For Jonah Miller, shunned by his Old Order sect and cast into the wider world, the summer begins with his decision to kidnap his ten-year-old son from the home of the bishop who had exiled Miller a decade earlier. In his desperation to retrieve the boy, the bishop appeals for help to the only "English" men the sect would ever approve. Professor Michael Branden and Pastor Caleb Troyer had been looking forward to the kind of sleepy rural summer they had enjoyed as boyhood friends growing up in the small college town of Millersburg. Instead, they plunge into the normally closed Amish culture to find the boy. When the kidnapping leads to murder, they can no longer keep the case from the law. Working sometimes at cross purposes with his friend Sheriff Bruce Robertson, Professor Branden digs through the past to uncover truths that many would prefer to leave undisturbed. Little does he suspect that even the anguished bishop, torn by an insoluble moral dilemma, tragically does not tell everything he knows about the case. Suddenly the vast tangle of Amish and Mennonite settlements that sprawl among several thousand small farms and homesteads seems less bucolic than unknowable and impenetrable. 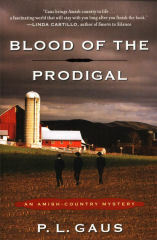 As they inquire delicately among the peaceful ones, Branden and Troyer learn that the troubles of Jonah Miller began far earlier than the kidnapping, with his Rumschpringe - the customary wild year before taking Amish vows. But his grand Rumschpringe had exploded into a decade of drugs, whiskey, and women, in the company of people no Amish person should meet. In the tradition of Tony Hillerman, P. L. Gaus depicts a culture that successfully stands outside the mainstream yet interacts with it in complex and fascinating ways, a culture that is every bit as susceptible to the undertow of the human spirit as any we might know.